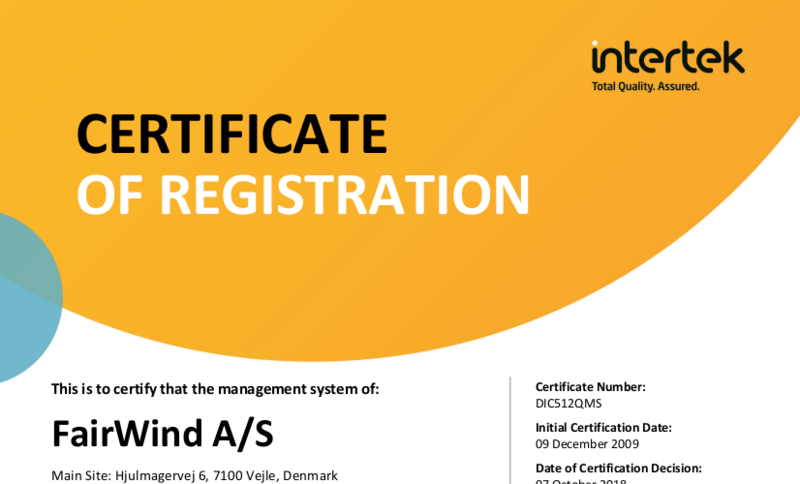 FairWind has retained its ISO certificates after an audit performed by Intertek, ensuring we will hold onto them for the next three years. The certificates include ISO 9001:2015 (Quality Management System), ISO 14001:2015 (Environmental Management System), and OHSAS 18001:2007 (Health and Safety Management). Additionally, our Danish office secured the OHSAS 18001:2008 BEK 1191:2013 certificate. FairWind maintains quality through clearly established procedures and adherence to the standards set for these integrated management systems. These standards are recognized by organizations throughout the globe. The auditors lauded this strong commitment from FairWind’s management. They also mentioned recruitment, education, and training; planning and execution of installation projects; efficient operations in Service; and a well-structured and efficient warehouse as positive points, among others. FairWind’s integrated management system and compliance to ISO standards is headed by a dedicated QHSE department and Quality & IMS Manager Daniel Jastrzebski. The certificates are available on the Fairwind website.